Debutants Pune Warriors are likely to keep their winning combination intact when they go into their second home clash against another new franchise, Kochi Tuskers Kerala, in the fourth edition of the Indian Premier League, in Mumbai, on Wednesday. 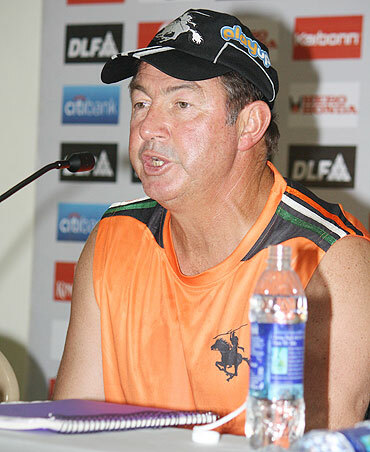 Pune scored a comprehensive seven-wicket victory over Kings XI Punjab on their IPL debut two nights ago, and coach Geoff Marsh hinted they will more or less stick with the same playing eleven against Kochi. "It's another big challenge for our boys. Hopefully, we will come out trumps. We had a very good win. When it comes to selection we don't want to change the team around too much after a very good win. We won't go too far from the eleven that played the previous night," said the Australian, ahead of the match at the D Y Patil Stadium. Marsh, who was full of praise for his team's all-round display in the seven-wicket victory over Kings XI, expects the wicket for match to exhibit an appreciable bit of pace and bounce, as was the case in their opener. "We are preparing for another game tomorrow night. Very pleased with the first game and the way we started. We will be hoping to do the same tomorrow night. "(I am) very happy with the bowlers, making Kings XI 4 for 9. Shrikant (Wagh) and Alphonso Thomas were terrific. (Wayne) Parnell also bowled very well. To bowl them out for 113 was a good all-round performance. There are areas we would be looking to improve and get better at. But overall our bowlers were terrific," he remarked. "(Wicket) looks exactly the same, probably a little bit dry. Will have the same pace and bounce. (We are) looking forward to playing on it. It will play pretty much the same. It's a good cricketing wicket," added the former opening batsman. Stating that 150 is the average score on the DYP wicket, Marsh said his team is keen to score a few more runs if they are to set a target tomorrow. "Average score here is around 150. We would be looking for a few more than that," he said. Marsh said while all the players are fit, some of them who had taken part in the World Cup, had been given a day off from practice to rest and recoup. "As far as I know everyone is fit. We have rested some of the players from practice as some of the players have been in the World Cup. (We are) trying to get them nice and sharp. "Yuvraj has had a very busy World Cup and a very busy week after that. We would like to freshen him up and give him some time to catch up with his sleep," he said. The Pune coach also said that a replacement for injured Sri Lankan all-rounder Angelo Mathews, who has been ruled out of the event, would be declared by the franchise owners soon, adding Ashish Nehra -- who has undergone surgery - is expected to play at a later stage. "Mathews is not coming. He's out of IPL. Franchise will make an announcement about Mathews' replacement in a couple of days. Ashish (Nehra) is coming back. He's had the operation and would need a couple of weeks. 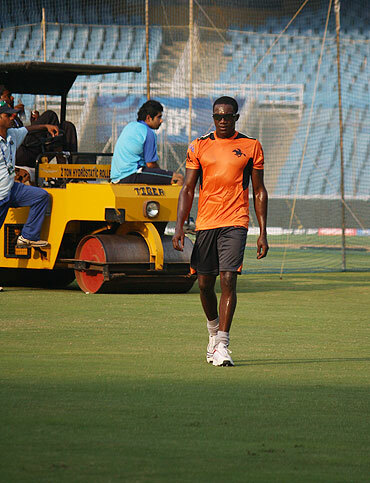 (West Indian) Jerome Taylor is here," Marsh said. The former Australia cricketer preferred not to look too far ahead about qualifying for the second stage. "We are not looking any further than tomorrow game. We would be focusing on that. Hopefully, we would win enough games to qualify for the finals. We don't want to get ahead of ourselves take it one game at a time," he declared. Team member and left-arm spinner Murali Kartik said Pune's strength lies in the fact they bat deep and also nine of the players can roll their arm over. "We had nine who could bowl and we bat till eleven. Alphonso (Thomas) comes in at No 11 and has three first class centuries (to his credit). It's just an advantage we have got so many options," said the seasoned cricketer, who has been ignored of late by the national selectors. He talked in glowing terms about his Somerset county teammate Alphonso, who he described as a very skillful bowler. "Alphonso is very skillful and knows what he's doing. In a format like T20 when you are always under the thumb the execution of skills is very important, as a bowler that's what you want to do. When you need to bowl a certain ball you need to do that and that's what Alphonso is very good at. "When he wants to bowl a yorker he can nail that yorker. Similarly, whatever he wants to do he can do. He's got skills with the ball like you talk about Zaheer Khan," said Kartik. The Railways player said the other day he bowled only one over while the team did not require the services of captain Yuvraj Singh, man-of-the-tournament in the just-concluded World Cup, at all. "I bowled one over in the Power Play, then both me and Yuvraj were not required to bowl. He (Yuvraj) did not want to bowl when there were two left-handers (batsmen). That's a call you take on match day. It was a cricketing decision," Kartik said. Yuvraj, who grabbed 15 wickets with his left-arm slow bowling to play a crucial role in India's World Cup triumph, has not altered his bowling technique at all, according to Kartik. "There's no change at all with Yuvraj's bowling action. You can't do much technically. He's the first one to laugh it off," he said. "He's always been a good bowler. Sometimes when you do well with the bat or the ball it transforms on to the other form of your game. It happens with every cricketer. Cricket is all about confidence and momentum," he added. 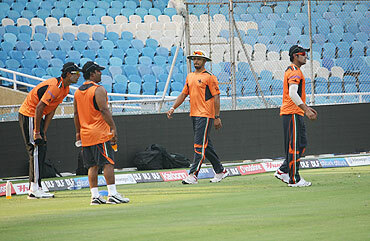 Kartik also said that the wicket at the D Y Patil Stadium is a good cricketing track. "We have played on this wicket before. It's a good cricketing wicket. When you say good cricketing wicket it suits all sorts of bowlers," he commented. Kartik said most of the top players playing for Kochi are known commodities who had played in the IPL before. "It's a new franchise, but most of the players we've seen playing in the IPL. They have players like Brendon McCullum, (VVS) Laxman , Mahela Jayawardene, Muttiah Muralitharan and (Brad) Hodge. All those guys have been part of different franchises. "Just that it's a new name, post-auction. It's a battle of newbies, but it's a battle of old war horses there (as well)," is how he put the encounter in perspective.